There is, of course, some backstory here. In the past, we’ve been able to announce upcoming TBEX conference destinations at the close of each event. It’s a bit of an Olympic passing-of-the-torch thing, when the next host gets to take the stage and invite attendees to join them in their lovely part of the world for the next TBEX. We love the reveal, and we think you love the anticipation of the announcement, too. Unfortunately, the front-runner location for TBEX 2014 in North America was basically all ready to go – we were just about to book flights for our final site visit – when they decided they had to cancel their bid. After hearing about the bandwidth TBEXers have been using at recent conferences, they realized they didn’t think they could deliver the kind of internet support we require. That meant an 11th hour return to the drawing board – and that’s where we still are today. We’ll be doing final site visits very soon, and we really hope we can choose a location and make our announcement by the middle of February (if not sooner). You guys have been extremely patient, and we appreciate that – we know you’re trying to plan your 2014 travels, and we would very much like to be included in your trip planning for the year. We’ll get the word out just as soon as we possibly can. To be sure you’re notified when we do announce the 2014 location, make sure you’re signed up to receive our e-newsletter (the sign-up form is on the right-hand column of the TBEX blog), you subscribe to the TBEX blog RSS feed, and you follow us on social media. Trust me – we’ll be shouting it from every available rooftop once we’ve got dates and a destination. 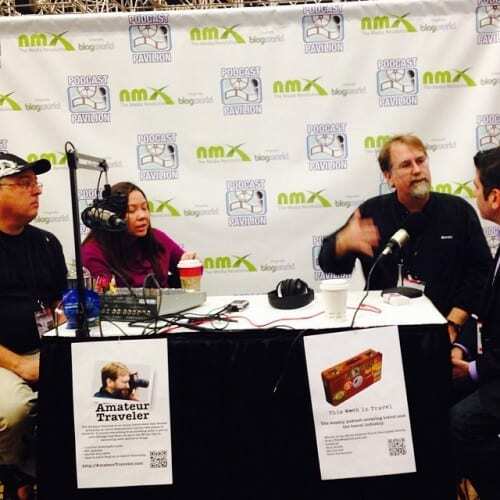 And despite what Rick and Mary Jo said on the episode of This Week in Travel recorded at NMX (link when it’s been posted online), neither this year’s TBEX nor any future edition will be held in Rick’s living room. If you guys would foot the bill for a bit of the conference, I doubt you would have trouble finding a location. But since you ask for everything for free, I’m not surprised you’ve been hearing crickets in return. I appreciate the explanation. Not having enough bandwith *is* a valid reason to drop out. Could you imagine the backlash if 1000 bloggers were all complaining about not being able to get onto wi-fi? Could be ugly! Absolutely. It’s great that they knew in advance – and who knows? Maybe they’ll come back to bid for a future year when they’ve got more WiFi infrastructure in place. I definitely appreciate the explanation and honesty. Happy to know we you guys are at and looking forward to more details later this month. Thanks so much for the update. I met some other attendees for lunch just yesterday in Atlanta and we were discussing this with wonder. Looking forward to hearing about destinations for 2014 and 2015! Fingers crossed the 3rd continent is South America! We need some Latin flavor! Hm. Before the wifi days, did people actually manage to meet up with other people…? Talk even and not just type away? Scary old world. Challenge out there: Who’s gonna organise the first ever wifi-free bloggers conference I wonder? This will be our first TBEX because last year we were in Europe during the Toronto’s TBEX and in New York during the Dublin one ha ha! Now we’ll schedule it better and we’ll try to assist! Looking forward to meeting the world travel bloggers! Please no more out of the way mountain destinations, which is the only way I would believe lack of bandwidth. are we any closer to knowing? It’s been another month. What’s the status? Will there be a TBEX in 2014? Yes we are very close to knowing now…. Trust me it is killing us to not tell you yet. We are super, super, super close. Is there an update? I believe one of the blog posts mentioned a mid-February announcement. I think ANY update (even if nothing is firm) is better than no information. 1) Will there even be a North American TBEX meeting? 2) If so, what months are being considered? If we at least know when it MAY be or when it WON’T be, we can have some ideas on how to plan. 3) Will there be a TBEX outside of North America this year? Might that be before the North American meeting? Is there anything you can share on a TBEX meeting outside of North America? I, for one, may be more interested in attending a conference in a foreign city than attending a conference in a city (in North America) I am not as excited about. 4) What cities in North America are currently under consideration? I’m sorry for the delay in answering your questions. We have been fighting some gremlins on the site and we haven’t been able to respond to comments. Here are the answers to your questions in order. 1. Absolutely there will be a TBEX North America in 2014. We have four finalist destinations. We let it slip that Las Vegas was one of them. 2. Most likely it will be June or July. We have to be flexible on our dates to accommodate our host city. TBEX is always held in the shoulder season but shoulder season varies from city to city. 3. Absolutely there will be a TBEX Europe this year. It is very unlikely that TBEX Europe will happen before TBEX North America. Typically TBEX Europe is held in September – October. 4. We choose not to share that. Hosting TBEX is a huge commitment for a destination and there are dozens of factors that go into the destinations and our decision. We don’t think it is fair to our host city partners to put them on the spot before announcing the host city for the year. Thank you for your response. You have answered my questions. Will we know the North American location before the discount expires for the European location? For those of us who may be forced to choose location or the other, it would be helpful to know where/when in North America so we can make an informed decision. Is New Orleans one of the finalists? I ask because I know the prices drop dramatically here in the Big Easy, once the summer hits. Can find some amazing deals on hotels and the restaurants start offering some pretty cool discounts.